Heavy gunfire erupted on Monday in Ivory Coast’s two largest cities of Abidjan and Bouake as the military said it pressed an operation to quash a four-day nationwide army mutiny over bonus payments, witnesses said. Residents also reported gunfire in the port city and major cocoa hub of San Pedro. 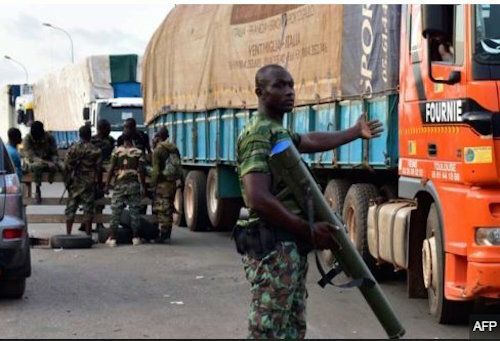 More than 200 commercial trucks were stranded on the roadside after mutinous soldiers sealed off the southern entrance to Bouake, the epicentre of the revolt, on Monday, Reuters witnesses said. London cocoa futures climbed to a five-week high on Monday due to the unrest in Ivory Coast, the world’s top producer as businesses in the sector closed. A Reuters team travelling from the capital Yamoussoukro towards Bouake, saw only a handful of loyalist military vehicles, a day after the head of the army said troops were being sent there to “re-establish order”. Most of a large column of troops spotted on Sunday evening appeared to have withdrawn – suggesting any government operation was not yet fully under way. Sporadic gunfire was heard overnight in Bouake as well as at military camps in Abidjan. Shooting in both cities intensified before dawn. “There was heavy shooting at the northern entrance to the city and in the city centre. It’s calmed a bit but we’re still hearing gunfire,” said one Bouake resident. Other residents confirmed the shooting. The soldiers staged the revolt over delayed bonus payments promised by the government after a mutiny in January but not fully paid after a collapse in the price of cocoa, Ivory Coast’s main export, caused a revenue crunch. Ivory Coast has been touted as a post-war success story because it emerged from a 2002-2011 political crisis as one of the world’s fastest growing economies under President Alassane Ouattara. But it remains divided and a wave of mutinies that began earlier this year has exposed the lack of unity in a military assembled from former rebel and loyalist combatants. In signs of the economic impact of the crisis, the banking association, the APBEF, ordered all banks to remain closed on Monday and many businesses at the port in Abidjan from which cocoa is exported were also closed. Heavy shooting was also heard in Daloa, a hub for western cocoa growing regions. A spokesman for the mutiny denied that any clashes occurred in Bouake and said the renegade soldiers were firing in the air to dissuade any advance on the city. On Sunday, the group’s leaders rejected the army’s demand that they disarm and surrender. The 8,400 mutineers, most of them former rebels who said they were promised bonuses for fighting to bring Ouattara to power, received 5 million CFA francs ($8,400) each to end the January uprising. But the government has struggled to pay remaining bonuses of 7 million CFA francs. A spokesman for the group said on Thursday they had dropped demands for the remaining money, an announcement rejected by many of the soldiers who sparked the current revolt. An Abidjan resident said mutinying soldiers came out of the largest military camp and erected barricades early on Monday, blocking traffic along one of the main thoroughfares in the east of the city. Several schools near the camp did not open and the Abidjan-based African Development Bank, which employs several thousand people – many of them international staff – told its employees to stay home. “I’ve been hearing the sound of Kalashnikovs and a heavier weapon. That began at around 5 a.m. (0500 GMT) … It’s intense,” said another Abidjan resident, who lives near the U.S. Embassy and the presidential residence. At least eight people were shot by the mutineers in Bouake and the northern city of Korhogo on Saturday and Sunday as popular opposition against the revolt gathered momentum, sparking protest marches in several cities, including Abidjan. One man, a demobilised former rebel fighter, died on Sunday.